Watch your favourite video songs and movies in video player. It supports MPEG4, H.263, H.264, DivX, XviD, WMV, RealVideo 10 file types. Listen to your favourite songs in music player. It supports MP3, AAC, eAAC, eAAC+, WMA, AMR etc. file types. Nokia's free fall over the past three years certainly took them a long way from the top. They still aren't prepared to battle it out at the highest level so they need to buy some time until they get up to speed. 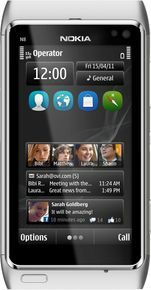 And the Nokia N8 seems a damn good shot at that. We had more than 200 readers casting their votes. There is no doubt that the general disposition is that the Nokia N8 is the best camera of the three, followed by the Sony HX5v digicam and finally, the Samsung Pixon12. Yep, the numbers are pretty self-explanatory. It's been a nice and informative interview for us. We really hope you paid attention but if you haven't, here are the main points that deserve recapping. looking to performance with android,N8 processor is lesser than any android mobile phones ie, more the processing power less battery life In graphics android is better but nokia not bad in as home screens and wizards were added. Comming to body and hardware nokia is the best in market.